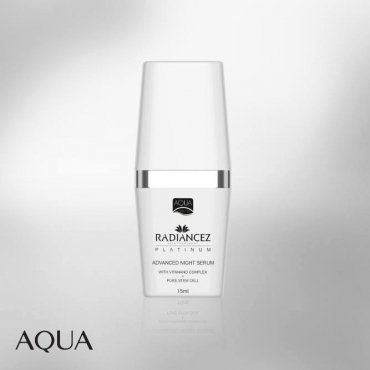 Radiancez Night Serum (15ml) restores, repairs and revitalises your skin when you are asleep by repleneshing it with essential nutrients that were robbed off due to the hassles of everyday life. Combination of Piper Betle extract, Nigella Sativa seed extract and Vitamin E stimulates collagen and elastin production, providing the skin with optimal regeneration and moisturisation. Contains Pure Stem Cell to effectively reduce skin pigmentation and defends against key ageing factors. Australian Tea Tree Oil combats pimples and prevent scarring. Apply after using Radiancez Facial Cleanser for best effect. Radiancez Skin Treatment Set is a complete 3-step skin care system which rejuvenates elasticity and smoothness of delicate skin, helps brightens and whitens your skin, and fights the signs of ageing, wrinkles, acne and discolouration. Radiancez Skin Treatment is suitable for all skin types. Alcohol & Paraben free. Halal, GMP and KKM approved. Radiancez Night Serum memulih dan membaiki kulit anda ketika sedang tidur dengan memberikannya nutrien-nutrien penting yang hilang ketika bekerja di siang hari. Gabungan ekstrak Sireh, biji Habbatus Sauda dan Vitamin E merangsang penghasilan kolagen dan elastin yang memberikan kulit pertumbuhan dan kelembapan optimal. Mengandungi Pure Stem Cell untuk mengurangkan pigmentasi dan melawan tanda-tanda penuaan dengan berkesan. Minyak Tea Tree Australia memerangi jerawat dan jeragat serta menghalang parut dan cela. Untuk kesan terbaik, gunakan selepas menccui muka dengan Radiancez Facial Cleanser. Set Rawatan Wajah Radiancez amat sesuai untuk semua jenis kulit. Lulus Halal, GMP dan KKM.